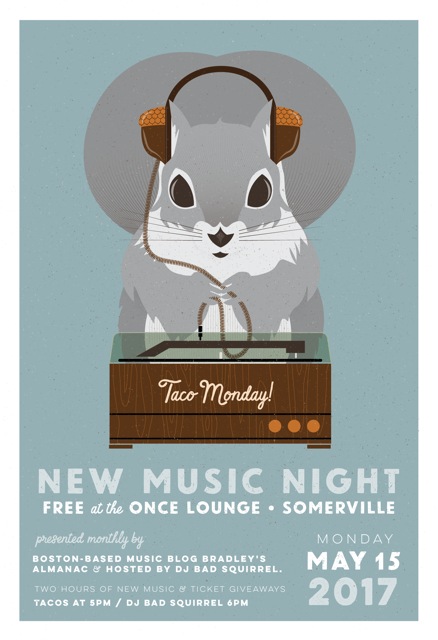 The May 2017 edition of NEW MUSIC NIGHT is going down this very evening at the wonderful ONCE Lounge in Somerville starting at 6pm. For the uninformed: Two hours of nuthin’ but new songs spun between free ticket giveaways for a bunch of upcoming Boston-area shows, all while you chow down on some super-tasty tacos. It’s a fine time indeed, a nice way to start the week, and I say that not just because I’m your sonic selector. I simply love hangin’ at the place. So what can ya win? How about pairs of tickets for imminent local appearances from Will Johnson (Centro-matic), John Moreland, Mary Timony (as Helium! ), Land of Talk (!!! ), Psychic Dog (album release! ), When Particles Collide, PowerSlut, The Knock Ups, Charly Bliss, Yucky Duster, Lost Dog, Coco Hames (of the Ettes), and Little Bandit. Just show up, throw your entry in a Chinese take out container, and cross yer fingers that I call your name. For the curious, below lies a look at last month‘s playlist, and if you want to dig deeper, check out my past & future ‘Nac Tracks monthly streaming Soundcloud playlists of newly-discovered songs. If you can’t make it tonight, shoot for next month’s NMN on June 12th from 8-10pm.